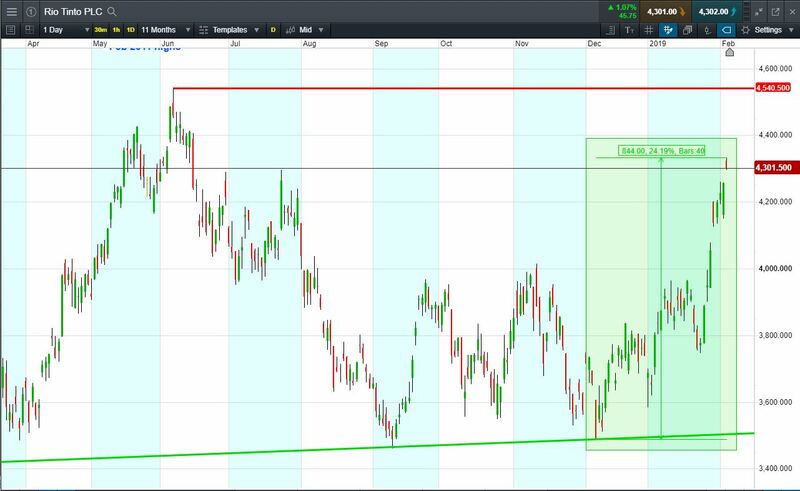 Will Rio Tinto turn, or will it continue to rise to 2018 highs around 4540p? Shares +24.2% from November 2018 lows. Accident at rival Vale’s mine in Brazil spiked iron ore prices. 5 Jan: Brazil halting the use of dams over the mining accident. Now trading 4301.5p (at the time of writing). Will the positive momentum continue towards 4540p? Shares trading at 2019 highs; +19% from 2019 lows; +15.3% year-to-date. Let’s say the trend appeals to you, you think it’s likely to continue. You decide to buy exposure to £10,000 worth of Rio Tinto using a CFD, at the current price of 4301.5p. To do this, you need £2,000. Let’s assume the Rio Tinto trend continues to 2018 highs of 4540p (+5.5%). Your profit would be £550, from your initial investment of £2,000. Conversely, let’s assume you open the above position, and place a stop-loss at 3% from the current price. Rio Tinto falls 3% and hits your stop-loss. Your loss would be £300.